Some changes in the heart and blood vessels normally occur with age. However, many other changes that are common with aging are due to modifiable factors. If not treated, these can lead to heart disease. The heart has two sides. 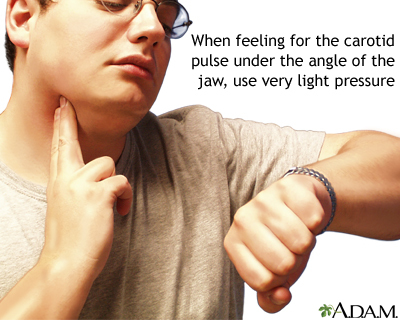 The right side pumps blood to the lungs to receive oxygen and get rid of carbon dioxide. 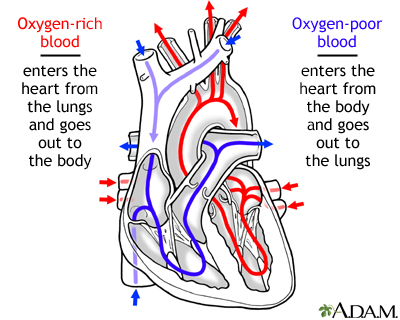 The left side pumps oxygen-rich blood to the body. Blood flows out of the heart through arteries, which branch out and get smaller and smaller as they go into the tissues. In the tissues, they become tiny capillaries. Capillaries are where the blood gives up oxygen and nutrients to the tissues, and receives carbon dioxide and wastes back from the tissues. Then, the vessels begin to collect together into larger and larger veins, which return blood to the heart. 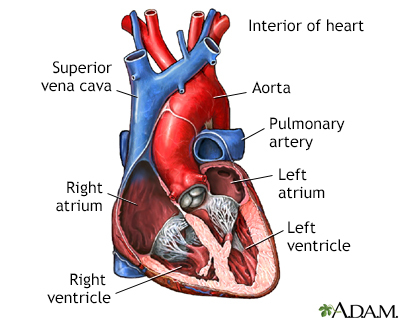 A slight increase in the size of the heart, especially the left ventricle occurs in some people. The heart wall thickens, so the amount of blood that the chamber can hold may actually decrease despite the increased overall heart size. The heart may fill more slowly. Normal changes in the heart include deposits of the "aging pigment," lipofuscin. The heart muscle cells degenerate slightly. The valves inside the heart, which control the direction of blood flow, thicken and become stiffer. A heart murmur caused by valve stiffness is fairly common in older people. Most of the white blood cells stay at the same levels, although certain white blood cells important to immunity (neutrophils) decrease in their number and ability to fight off bacteria. This reduces the ability to resist infection. Normally, the heart continues to pump enough blood to supply all parts of the body. However, an older heart may not be able to pump blood as well when you make it work harder. Angina (chest pain caused by temporarily reduced blood flow to the heart muscle), shortness of breath with exertion, and heart attack can result from coronary artery disease. Abnormal heart rhythms (arrhythmias) of various types can occur. Anemia may occur, possibly related to malnutrition, chronic infections, blood loss from the gastrointestinal tract, or as a complication of other diseases or medicines. Arteriosclerosis (hardening of the arteries) is very common. Fatty plaque deposits inside the blood vessels cause them to narrow and totally block blood vessels. Congestive heart failure is also very common in older people. In people older than 75, congestive heart failure occurs 10 times more often than in younger adults. Coronary artery disease is fairly common. 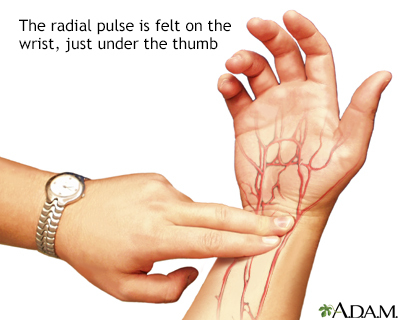 It is often a result of arteriosclerosis. High blood pressure and orthostatic hypotension are more common with older age. Older people on blood pressure medicines need to work with their doctor to find the best way to manage their high blood pressure. This is because too much medicine may cause low blood pressure and could lead to a fall. Heart valve diseases are fairly common. Aortic stenosis, or narrowing of the aortic valve, is the most common valve disease in older adults. Transient ischemic attacks (TIA) or strokes can occur if blood flow to the brain is disrupted. Aneurysms may develop in one of the major arteries from the heart or in the brain. Aneurysms are an abnormal widening or ballooning of a part of an artery due to weakness in the wall of the blood vessel. If an aneurysm bursts it may cause bleeding and death. You can help your circulatory system (heart and blood vessels). Heart disease risk factors that you have some control over include high blood pressure, cholesterol levels, diabetes, obesity, and smoking. Eat a heart-healthy diet with reduced amounts of saturated fat and cholesterol, and control your weight. Follow your health care provider's recommendations for treating high blood pressure, high cholesterol or diabetes. Reduce or stop smoking. Men between the ages of 65 to 75 who have ever smoked should be screened for aneurysms in their abdominal aorta. Exercise may help prevent obesity, and it helps people with diabetes control their blood sugar. Exercise may help you maintain your abilities as much as possible, and it reduces stress. Moderate exercise is one of the best things you can do to keep your heart, and the rest of your body, healthy. Consult with your provider before beginning a new exercise program. Exercise moderately and within your capabilities, but do it regularly. People who exercise often have less body fat and smoke less than people who do not exercise. They also tend to have fewer blood pressure problems and less heart disease. 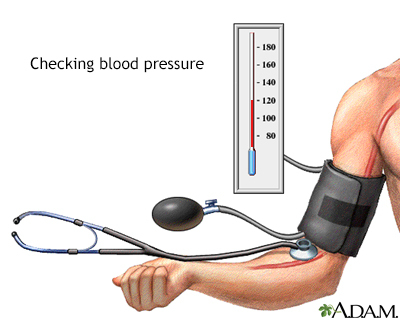 Have your blood pressure checked every year. If you have diabetes, heart disease, kidney problems, or certain other conditions, your blood pressure may need to be monitored more closely. If your cholesterol level is normal, have it rechecked every 5 years. If you have diabetes, heart disease, kidney problems, or certain other conditions, your cholesterol may need to be monitored more closely. Forman DE, Fleg JLl, Wenger NK. Cardiovascular disease in the elderly. In: Zipes DP, Libby P, Bonow RO, Mann DL, Tomaselli GF, Braunwald E, eds. Braunwald's Heart Disease: A Textbook of Cardiovascular Medicine. 11th ed. Philadelphia, PA: Elsevier Saunders; 2019:chap 88. Howlet SE. Effects of aging on the cardiovascular system. In: Fillit HM, Rockwood K, Young J, eds. Brocklehurst's Textbook of Geriatric Medicine and Gerontology. 8th ed. Philadelphia, PA: Elsevier, 2017:chap 16. Seki A, Fishbein MC. Age-related cardiovascular changes and diseases. In: Buja LM, Butany J, eds. Cardiovascular Pathology. 4th ed. Philadelphia, PA: Elsevier Saunders; 2016:chap 2. The normal heart viewed so that major valves can be seen.